An Abhisheka is a ceremony of ablutions and symbolic offerings that include milk, honey, ghee, and other items. The ablutions symbolize spiritual purification, and each of the offerings represents fulfillment on every level. Throughout the abhisheka, specific mantras are chanted to invoke blessings that uplift, protect and spiritually benefit us. Any devotee can take yearly or monthly sponsorship for Abhisheka for any deity. For more details see below and/or contact the manager. Chanting of 108 holy names of the God/Goddess by the priest. Chanting of 1008 holy names of the God/Goddess by the priest. Three flower garlands will be supplied on request and payment. Advance request is required. Normally when one is seriously ill, the scriptures recommend vahana sevas as the gesture of gratitude to the Lord or to get quick recovery. The Temple offers these services for the benefit of the devotees. When a devotee is going through a very difficult period astrologically, he can perform the Vahana Seva. Garuda Vahana, Sesha Vahana, Hanumantha Vahana (Sri Rama, Venkateswara), Nandi Vahana (Siva). Three flower garlands for deities and one for Vahana, loose flowers, one coconut, fruits, flowers and home cooked prasadas. Decorated deities are seated on the Vahana. A special sankalpa and puja is performed. The sponsors are asked to go around the deities and Vahana as per their desire. Mantra Pushpa is chanted - Theertha prasada is given with Aseervada. The sponsorship details and flower expenditure details can be found from the Manager. Tula Bhara and Unjal Sevas also can be arranged at the request of the Devotees. Abhisheka for any 11 deities once a week for a period of one year $5,001. Abhisheka for any 7 deities once a week for a period of one year $3,001. Abhisheka for any 3 deity once a week for a period of one year $1,116. Monthly once abhisheka for 1 deity for a period of one year is $301. 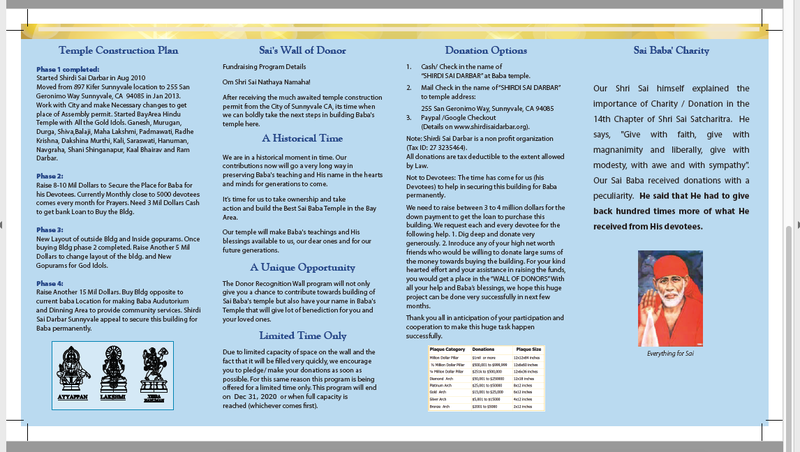 By paying $10,001 any devotee can sponsor for this program. In this, apart from of the abhishekas for all the deities, all Temple sponsored (celebrated) festivals and Pujas, including all Sevas (Muthangi, Poolangi, Tiruppavadai, Vajra Kiireeta) + one ‘at Home’ Puja of the devotee choice + one Satyanarayana Puja + One Kalyana Utsavam (Balaji/Shiva/Valli) + One Sahasra Nama Archana (for Birthday/Wedding Anniversary or any other) for one year. In this program in addition to these functions, Balaji Kalyanam and one of Shiva or Subramanya Kalyanam are also included. The sponsor should take the responsibility to inform the Temple at least two weeks before the Kalyana utsavams they choose to perform. 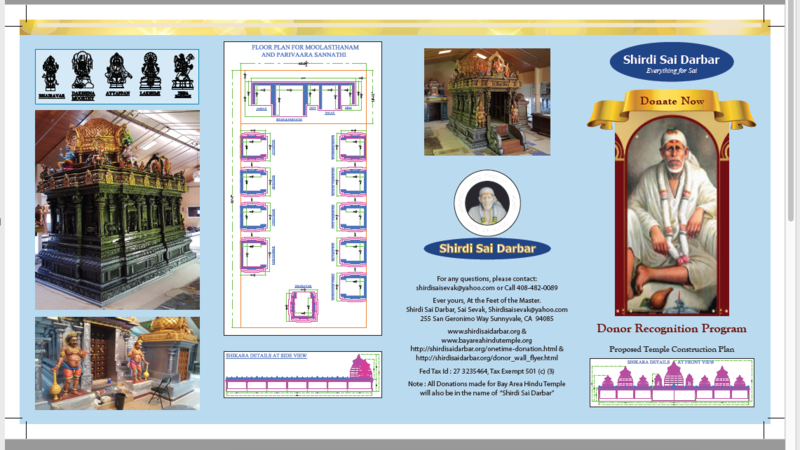 For more details please contact the Temple manager.